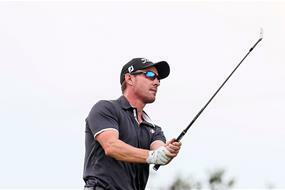 Two-time defending champion Gareth Paddison is looking hard to beat at the 10th Autex Muriwai Open as he breezed past the field on another windy links day to lead by five-shots over Muriwai’s very own Mark Hutson and Wellington’s Daniel Hillier. It was clear the 38-year-old was in the zone today after firing from ball one to record five birdies in his first seven holes to end with a round of five-under 67 to compliment his opening 66. To be this far ahead in the conditions provided has been immensely impressive and with the rest of the field so bunched up, it’s Paddison that has complete control over the last event of the New Zealand summer. “It’s very satisfying on a tough day and it was a grind from the very first hole, but I managed to put together a good front nine which was great,” said Paddison. It seemed far from a grind as the five-time Jennian Homes Charles Tour winner made the turn in just five-under par, 31. We are only halfway through the Autex Muriwai Open, but it feels like the script is already written entering the weekend as Paddison looks to keep things simple. Local member Mark Hutson brought a smile to the clubhouse after shooting a round of two-under to now sit in second place alongside Daniel Hillier to balance out the age of the final group tomorrow. The rookie-professional is searching for a breakthrough win at this level and it would be fitting if he was to do it at a place where he has learnt his trade throughout his young career. Hutson and Hillier are followed by Kerry Mountcastle and Dan Pearce who are tied for fourth, while names such as James Anstiss and Josh Geary are waiting in the wings for Paddison to fall back to the chasing pack. The biggest ray of light to shine over the gusty Muriwai Golf Links was Mako Thompson’s sensational albatross on the par five second. The Hawkes Bay number one had volunteers almost in tears of joy as they watched the special moment from 186metres away. Overnight leader Yeonsoo Son continued her consistency on the Muriwai Golf Links to maintain her two-stroke lead entering the exciting weekend. The 13-year-old from the North Shore Golf Club mixed three birdies with four bogeys in what is becoming the very normal gusty conditions to lead over the in-form Caryn Khoo. If she is to claim her first Jennian Homes Charles Tour victory it will have to be done the hard way with Khoo, the Akarana Open champion, lurking with intent in second place. The pair will be joined by Anna An in the final group who is a further two strokes behind Khoo. The players will enjoy a sleep in tomorrow with proceedings getting underway at 8:30am.